There are four main views in Reserve Analyst that take you from input of your data, setting up your math, and producing a report. Hover mouse over image to see larger sized image. The Account Information View of Reserve Analyst© is where you enter information about your reserve study project. 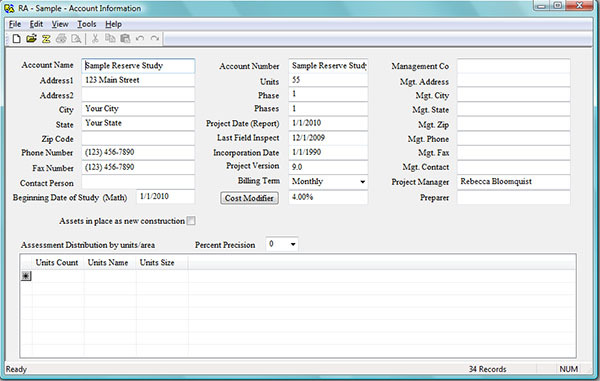 This information includes: Name, address and contact information for the project, information about specific aspects of the community, management company name, address and contact information, set up math models, set billing term to monthly, quarterly, bimonthly or annual, also set area cost modifier for component cost database information. The Math View is very dynamic and consists of 2 parts: the Main Math View window and the Math Analysis dialog box. The Math Analysis dialog box controls the information displayed in the Main Math View window. Use the drop down box to choose the math model to view as well as radio buttons to display Distribution, Projection, Expenditures and Statistics for each math model. What ever view is currently showing can be printed with a click, and as it would show in the report. Use the "Edit Models" button to edit existing or add new math models. Edit existing math models directly in the boxes and then push the "Recalc" button to instantly view results when you are ready. 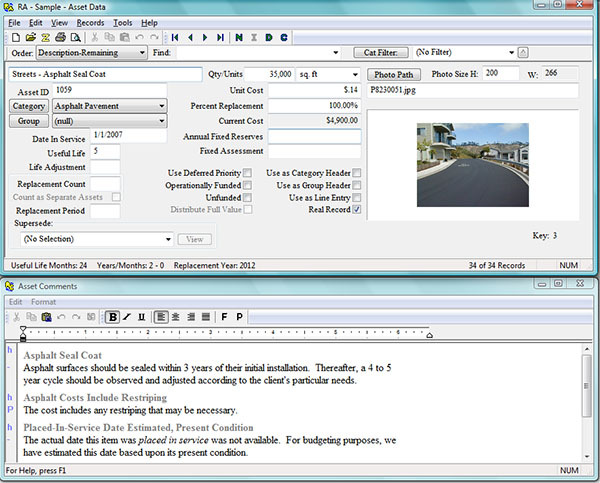 The Asset View consists of two windows: the Asset Data and the Asset Comments windows. In this view all of the details of the assets are recorded. Many features allow you to fund, report and describe your assets. Assets can be included in Categories as well as Groups; use words for the Categories to accurately describe the assets within a particular Category. Use the Groups feature to group building styles, phases of your community, sections of your development or any other Group description that best suits your needs. Navigating in the Asset View is easy with the Order, Find and Filter features. You will find these features a real time saver, especially in large projects. Add color digital photos of your assets with just a click. Use the Asset Comments window to precisely describe your assets. 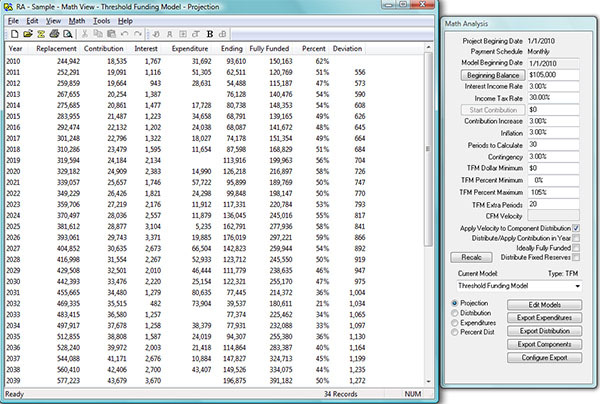 Calculations in the detail are automatically transferred to the asset count and amount with one keystroke. The Asset Comments window is a rich text editor allowing for use of different fonts, colors, tabs or paragraph formatting. 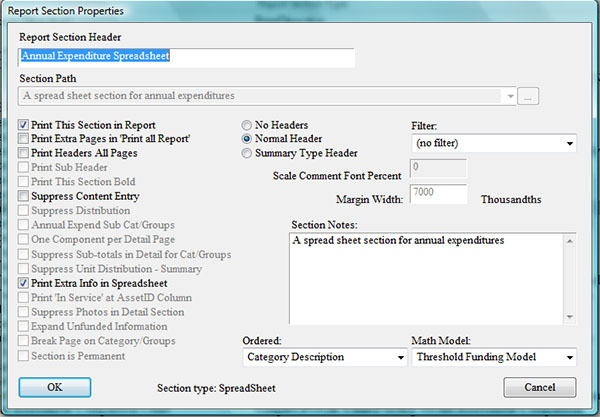 With a click, you can print the current asset as it would show in the report. Many more features are available for the Asset View. The Report View of Reserve Analyst© is where it all comes together. 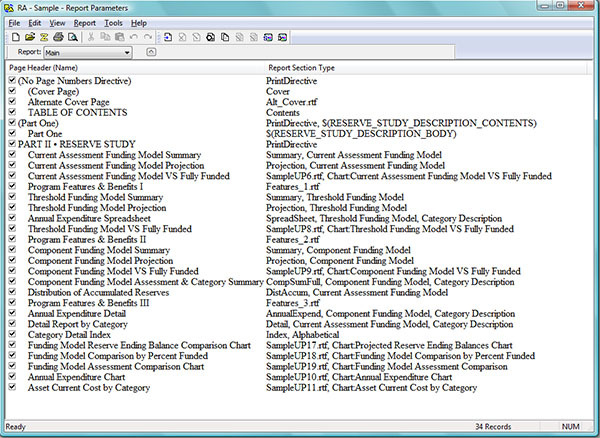 The Report Parameters window is where you choose which sections are printed with your report and in what order. You have complete control over how your report will look. Choose from several "Stock" sections, Charts and User Defined pages you design yourself. All of the Charts and User Defined sections are rich text allowing for a large variety of formatting options and can also be edited in Microsoft Word©. You can make as many types of reports as you wish for your main report, owner's report or testing math "what if" scenarios. Add and delete sections with a click. Turn sections on and off with the check boxes. Drag and drop sections to print in the order you want. Enter Footer information to be printed at the bottom of each page of your report. Use the check box options with the Options button to print "Replacement Year in Detail Title", "Print Item Cost When Quantity", "Print Part One in Contents", "Print ECHO Statement" and many other options. Print Preview your report with a single click. There are so many reporting options available which makes Reserve Analyst© the most flexible and powerful software on the market. Your report will be the most professional presentation of your data that you will ever see. 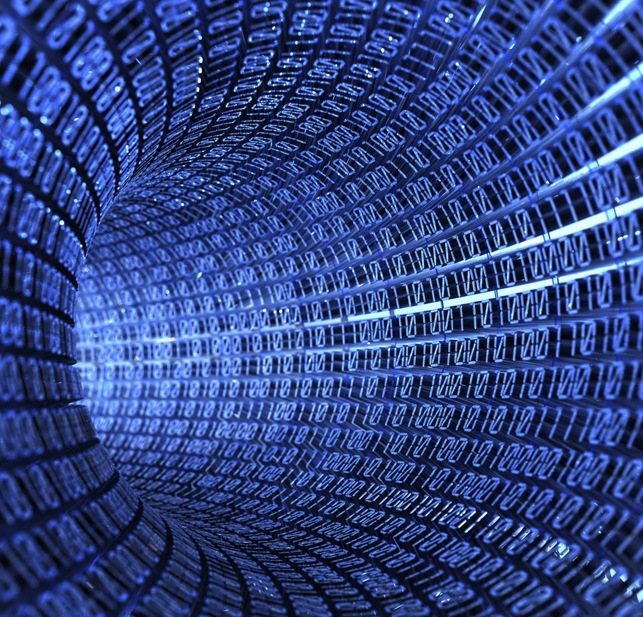 Easily Zip and e-mail project files to others or use as backup and archival purposes. 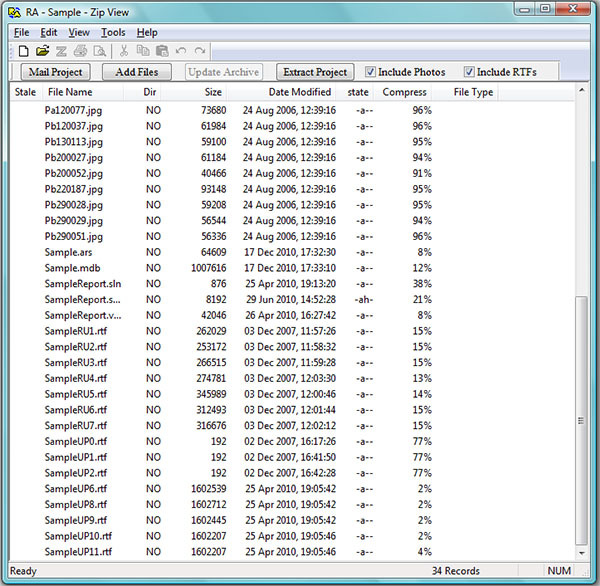 Include all of your project files including the photos in your zip file with a click. You can also add other files related to your project that aren't part of your report but are part of your project to the zip file. For instance, you can include letters, invoices or spreadsheet files to the zip file. With the click of a button the zip file can be sent via e-mail to share with others. Store your zip file on CD or other media for portability and archiving.